with part of current fleet. 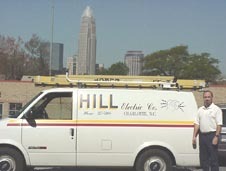 C. Neil Hill learned his trade by attending Charlotte College (now Central Piedmont Community College) and working as an electrician's helper. That was 71 years ago. Three and a half years later, Hill went into the electrical contracting business with a partner, which became his own firm. H. Michael Benton took over the presidency in 1996. 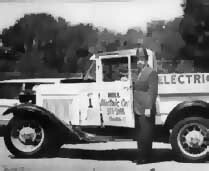 Michael has been with Hill Electric since 1978. He graduated from Independence High School in 1981. In 1985 he graduated from Appalachian State University. In 1988, he earned his Electrical Journeyman's License and in 1993 his NC Unlimited License. In 1996 he took over as president with his wife Debbie, and a team of dedicated men, right by his side. He has put his energies into Hill Electric, an operation that handles all types of electrical contracting. "We do mostly repeat business, and we stay busy year round." Our client base is 80% commercial, 20% residential. "We may do a little more air conditioning wiring in the summer, but we keep the same amount of help year round, and we don't have to adjust to the economy." Among the larger commercial wiring jobs Hill Electric has done are the five story Interstate Milling facility and a part of the (Tyvola Rd.) Charlotte Coliseum. Hill Electric ran the conduit under the seats for the foot lighting in the aisles of the former large public facility not far from Billy Graham Parkway. Being a reliable firm that can render quick service at good prices has made the firm prosper. "We try to be fair with everybody, as we strive to have repeat business and win new customers." We have a lot of regular customers for whom we do all of their work, and they expect us to help them look ahead and anticipate their needs. "We also do a lot of emergency service, and all our vans are radio / GPS equipped." With the proliferation in the 80s of computer systems at all size businesses, Hill Electric has added computer wiring and cabling to our services. With our computer wiring, we also install backup electrical generators and batteries to keep computers going in case of a power outage. We emphasize staying up to date on changes in the electrical contracting field. We maintain that all of our employees are trained to be current with all new requirements.